Since 1988 Dr. Michael Kenny has been helping people with their dreams of weight loss, burning fat and health and wellness. Dr. Kenny has helped people who thought that they could never lose weight. He has helped transform the lives of people suffering from fibromyalgia, chronic fatigue, diabetes and hypothyroid conditions. Dr. Kenny understands that you are unique. He understands that because you are unique you need an individualized custom designed program to help you lose weight. Dr. Kenny understands that the cookie-cutter weight loss programs and exercise programs that you see on television are not going to help you to lose weight and in most cases they will actually do the opposite and cause you to gain weight. Dr. Kenny understands that you're not being able to lose weight is not from a lack of effort on your part. You see most people think that they are eating right and exercising right but they are not. There is so much bad information out there that most people are totally confused about what they have to do to lose weight and be healthy. Hear me when I say that losing weight and being healthy is a science. It is biochemistry. Look at yourself like your body is a chemistry experiment because you are filled with chemicals and hormones. Each of these chemicals and hormones must be in harmony, they must be in a proper balance. The slightest imbalance of any of these chemicals and hormones will cause you to gain weight and can cause other problems as well. So you can see that losing weight is a science! Losing weight is not difficult if you know what to do! Dr. Kenny knows the science! Dr. Kenny knows what to do! Let Dr. Kenny help make the NEW YOU! 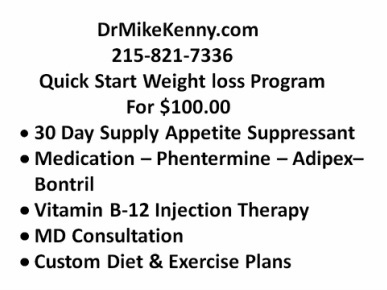 Call Dr. Kenny now at 215-821-7336 for a FREE Telephone consultation. Most of Dr. Kenny's patients have failed in the past at trying to lose weight. They even failed to lose weight with other weight loss programs. But on his program they are losing weight, feeling good and looking even better.